I know that you are going to love her work, her aesthetic and you will love working with her because she is a very lovely, generous lady of flair. I found Ms. Rhonda in my quest for all things Halloweenish. 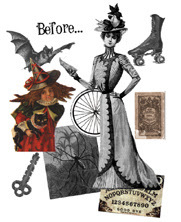 She has the most phenomenal Halloween Parade Paper dolls ever, as well as Marie Antoinette, Christmas and other holiday and fantasy paper dolls. This is her process. 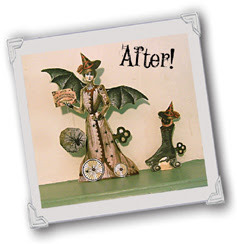 She was nice enough to share with me the befores and afters of her wonderful Halloween Spider Lady composition. There is a great deal of time and energy put into the finished product which I can hardly wait to experience for myself. The downloads are wonderful, complete and the instructions are very well written. The grands and I took the money I made recently on Etsy and invested it into the Halloween Parade parts 1 and 2. We have begun to get ready for my fav holiday ever and I'll share my completed goodies soon. Thanks Rhonda for being the May Featured Artist on Practically Magickal. I am overwhelmed by this beautiful presentation! Thank you so much! xoxox Rhonda! What a very unique, really beautiful paper doll! She is very gorgeous and beautiful! Excellent pick for your featured artist! Rhonda is very talented!